I'd have to say that the construction of the door in this article was probably a bit ill advised. It seems that there would be a water issue because of the below-ground-level entrance. I was not able to detect any sort of rain-water diversion for this door - the stone work of the pavement is not even raised a bit..
Additionally, there is this thing in Venice called 'aqua alta', which literally means high water. Aqua alta occurs when the tide and wind are aligned in such a way as to push water into the Venetian lagoon in excess of what it can handle - this causes flooding in the town of Venice. This flooding can be as much as a few inches (normal) to around three feet (abnormal). You can imagine water flowing into this 'door well' as the streets of Venice begin to flood. Fortunately, not much life occurs on the first floor in Venice...the second floor is where most of the traditional living begins, while the first floor is relegated to storage and such. 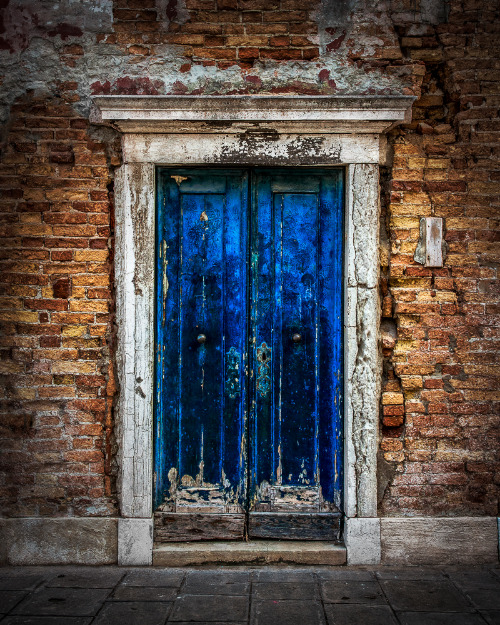 To transform the snapshot of this door, I began as I always do for Venice photos by removing extraneous conduits, pipes, etc. that are ubiquitous to Venice. Though these items do create a bit of an eyesore, the nice people who live there do need their electricity, gas and water. And, it is a bit of a chore to get these needed utilities into the old stone buildings. But hey, it's my job to remove these modern intrusions in my efforts to create a Venice of a by-gone era when these modern conveniences didn't exist. This second photo shows that I have now removed these items from around the entrance, and I have also gotten rid of the mail slot and modern keyholes and such on the doors. As the original snapshot was a bit 'flat' - i.e. lacking in contrast, saturation, and such - I worked a bit on those elements to get to this next point. Finally, my assessment was that the door itself was still a bit on the boring side, and was being overshadowed by the surrounding area in terms of color and texture. Wouldn't you agree? You will note that the area at the top of the door in the previous photo has red tones, and the bottom of the door has some cyan, or aqua, tones. It's subtle, but it's there. So, I brightened that door and increased the saturation of those illusive tones to achieve my final product - as you can see below. As this entrance has most likely been a couple of centuries, I suppose we shouldn't worry too much about the owner's water issues.